Zoe Tender Chunks are highly palatable soft & chewy treats, ideal for rewarding your dog on a daily basis. 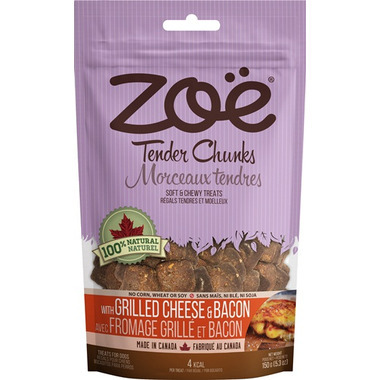 Zoe Tender Chunks are Canadian-made, and are 100% natural. Ingredients: Pork, Barley Flour, Brewers Yeast, Whey Powder, Molasses, Vegetable Glycerin, Cheddar Cheese, Coconut Flour, Natural Bacon Flavour, Vegetable Glycerin, Citric Acid. My dogs go crazy over these treats. My dog loves these! She also loves the beef and gravy ones.